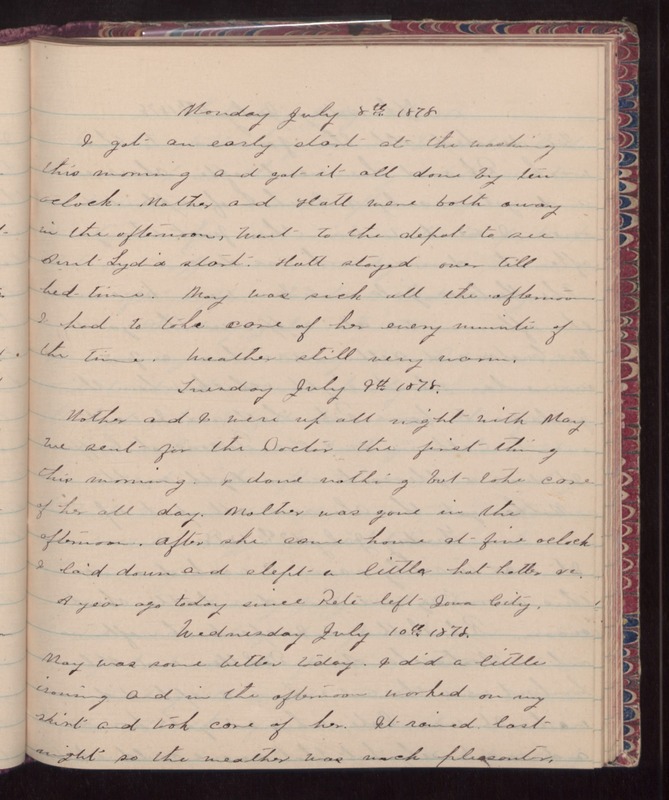 Monday July 8th 1878 I got an early start at the washing this morning and got it all done by ten oclock. Mother and Hatt were both away in the afternoon. Went to the depot to see Aunt Lydia start. Hatt stayed over till bed-time. May was sick all the afternoon. I had to take care of her every minute of the time. Weather still very warm. Tuesday July 9th 1878 Mother and I were up all night with May. We sent for the Doctor the first thing this morning. I done nothing but take care of her all day. Mother was gone in the afternoon. After she came home at five oclock I laid down and slept a little [hot hotter &c?]. A year ago today since Pete left Iowa City. Wednesday July 10th 1878 May was some better today. I did a little ironing and in the afternoon worked on my skirt and took care of her. It rained last night so the weather was much pleasanter.